Wire Rope for Oil and Gas Industries | Kennedy Wire Rope & Sling Company, Inc.
To select the proper wire rope for you application , visit the Union Wire rope website and see a list of commonly used wire rope products for your specific application. 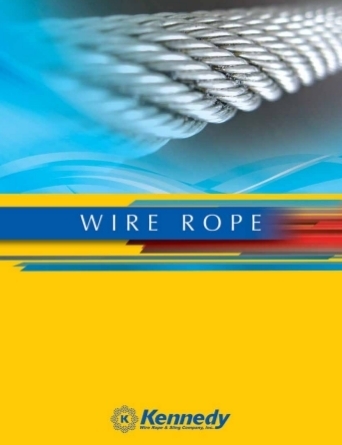 View the various types of applications and their respective commonly used wire ropes. At Kennedy Wire Rope & Sling Company, we understand how important it is for our customers to work with safe and reliable products. Customers who partner with us can rest assured that our decades of expertise lead to being one of the industry’s leading suppliers of wire rope, rigging hardware, and products that benefit the oil and gas industries today. Requires a rope that resists abrasions. The rope is also resistant to crushing and is a safe, fatigue-resistant piece of equipment. Well suited for tubing lines and highly resistant to crushing. Inner wires within the rope add to the rope’s durability and ability to resist fatigue. Constructed to help speed up the main hoist’s travel time during tubing and rod pulling operations. The rope also resists abrasions and crushing. Hostile conditions down a dug hole can damage wire rope considerably. This rope has a clean, smooth operation and is highly resistant to abrasions. This adds up to increased productivity, reduce downtime, and reduce rope changes. We’re dedicated to making sure our customers operating within the oil and gas industries receive the best services and support available in the market. As such, our mission is to make sure that we continually improve how we conduct our business operations. On example of this is our commitment to comply with and exceed ISO 9001:2008 standards. We also keep continuous education & improvements in mind for all that we do, to make sure our employees are the best trained and most experienced. With that, comes increased safety measures, which are always a top priority for us. Call 800-289-1445 and partner with us today. We, of course, carry all the proper licenses and insurances for our operations. We’re happy to answer all your questions and provide the best and safest rigging solutions you need for your application.